There is general agreement that helping families facing difficulties before they hit crisis point is good for them, and makes sound financial sense by reducing or delaying the need for more expensive statutory services. But what does a good ‘early help’ offer look like, and how do we help our children’s services improve their work in this area? In July 2018, the LGA commissioned Isos Partnership to research the factors that both help and prevent councils to develop and sustain an effective local early help offer. The findings are based on in-depth engagement with eight local areas that were continuing to invest in early help and doing interesting and innovative work with that investment. The areas also represented a mix of size, rurality, deprivation and funding. Each area had its own distinctive approach to developing its early help offer, based on the needs of residents and the history of how early intervention had previously been delivered locally. Despite these differences, however, there were some clear similarities between the eight areas, in terms of organisation and principles. When it came to their organisational structure, all eight had a ‘key work’ support service for families. This was typically delivered by a multidisciplinary team and tended to be targeted towards families exhibiting relatively higher levels and complexity of need. All the local authorities also supported statutory partners – including schools and early years providers, health and the police – to act as lead professionals for families requiring early help. They all had an underpinning offer of universal or group-based support, provided either by the community or through community-based local authority-run hubs, such as children’s centres. There was also a remarkable degree of similarity in the principles underpinning the eight areas’ approaches to early help. There were four themes that recurred consistently: the earliness of early help; working with families; building resilience; and an integrated, joined-up offer. 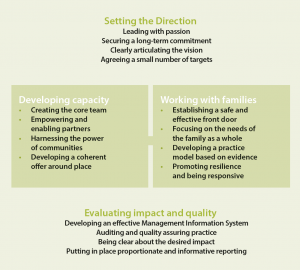 There was also a relatively high degree of consensus among council leaders and staff about the key factors enabling them to develop an effective and partnership-based early help offer (see diagram, right). They talked about ‘setting the direction’, ‘developing capacity’, ‘working with families’, and ‘evaluating impact and quality’. In ‘setting the direction’ for early help, a key enabler was leading with passion. Leaders in those local areas where early help was most embedded, and most effective, all demonstrated a strong conviction in the power of early help. Local areas fostered this sense of conviction and belief through the power of storytelling and creating a clear narrative, leveraging dissatisfaction with outcomes achieved by traditional ways of working, and making judicious use of the evidence base for early intervention. take organisational risks, or pursue creative – and sometimes untried – approaches, in order to deliver a more effective approach to early help. However, developing an effective offer requires not just passion, but also a long-term commitment. In most of the local areas included in the research, the political commitment to having in place an effective early help offer had not been limited by the timeframe of electoral cycles. The long-term nature of the commitment to developing effective early help had also, importantly, translated into continued funding. Although all the councils involved in the research were beset with the same budgetary pressures facing children’s social care and other statutory services, together with their partners they had managed, to date, to sustain a sufficient level of funding in early help. create a shared culture and co-create plans, reports and processes. They had also invested in training for partners, to ensure they were working to the same assessment, reporting and outcomes framework as other early help professionals. Place was also key to capacity building, with all eight councils using existing physical assets – in particular, children’s centres – to maintain a ‘public face’ of early help. Organising teams around places allowed them to develop in-depth community knowledge, with some councils able to point to how this had helped make services more responsive to changes in population or more precise in targeting support to the particular needs of local people. When it came to ‘working with families’, focusing on the needs of the whole family, rather than the individual, was fundamental to the eight early help offers that the Isos Partnership studied. For example, the ambition was for a family to be able to tell their story once – and for this to trigger a joined-up, multidimensional approach – instead of being referred between different experts. Local authorities also described how the family focus of early help had enabled them to challenge other services that have historically focused more on individuals, to think about supporting families more holistically. Finally, good evaluation was key to enabling the eight areas to continually refine the design and delivery of their services. For example, all recognised the importance of developing a reliable management information system that allows multiple partners to share data safely. However, getting different IT systems – within the council and among partners – to ‘talk’ to each other had proved challenging. This research raised many issues for the councils involved, and for us more widely in the local government family. The eight areas suggested they would benefit from additional tools and support to help them assess the impact and value for money of early help, and to have better oversight of local early help development strategies. early help expenditure, the impact on demand for statutory services, and the impact on long-term wellbeing. We have also suggested a framework that sets out for local authorities a range of strategies on how to approach the different phases of establishing an early help offer, organised according to the 16 key enablers.